A "select dynamic" field (or dynamic drop-down list) creates a menu (or drop list) with a single choice. A "select dynamic" field (or dynamic drop-down list) creates a menu (or drop list) with a single choice. It must contain at least one option. The field options are generated by the query filled in the configuration field. An option consists of a "text" part and a "value" part. The "text" is the text displayed in the form input and the "value" is the value recorded (likely to be used in a search form) after form submission. Assisted creation of the query to automatically fill field options ("text" and "value"). Write the first option in the dropdown list, any value associated with this option is recorded (zero). It is generally used to prompt the user to "select an option" or to indicate the type of options, such as "select a living"
Select the data table where are stored field options. Select the field used for the text of options. Write an SQL condition (clause), refer to SQL terms. Select the field used for the value of options. Write a "Order By" condition, like the name of a field. Enable or not the multiple mode by selecting "Yes" or "Not". It transforms the drop down list to allow multiple selections. 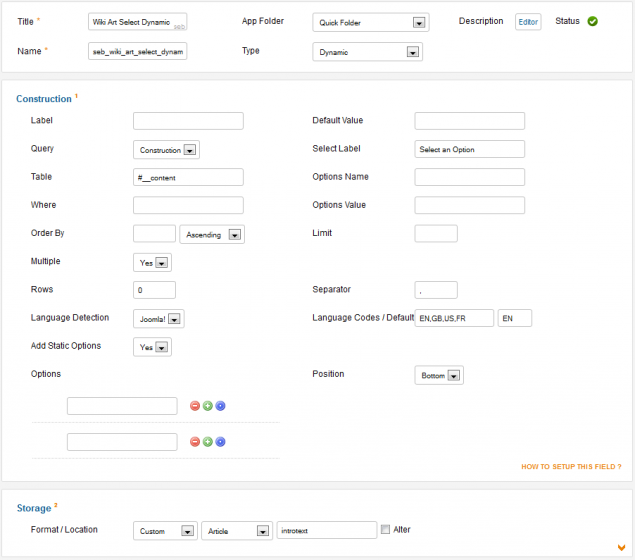 Select Joomla language or GeoIP language. If your data table manage a language field, you can enable the detection of the language and drop down list will be filter by this language. To use GeoIP, you must enable GeoIP module from Apache. The field will be formed by the list of "Mainmenu" menu links. 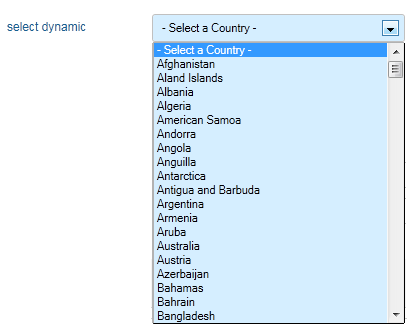 This field is a good alternative to "select single" field if the list of options is large and dynamic like for countries, cities, postal codes, categories, users. Often use to select only categories from a specific parent category when you want to save a content only in this children categories. value, text, options ?, default_value, ... to be completed (if generic, not to put here).